This is a late model 707 which is fitted with avionics of the same generation as the 737-200. The 707 had 60% commonality with the 727 which in turn had a 60% commonality with the 737. There are still parts of the newest 737-NG's that are exactly as fitted to the original 707. 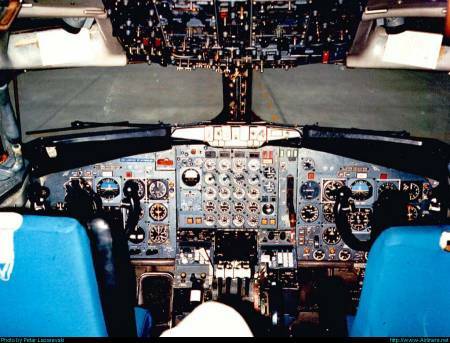 This photo of the 727-200 shows the striking similarities between the cockpit layout of it and the 737-1/200. This was the intention of Boeing so that pilots could easily convert from one to the other. 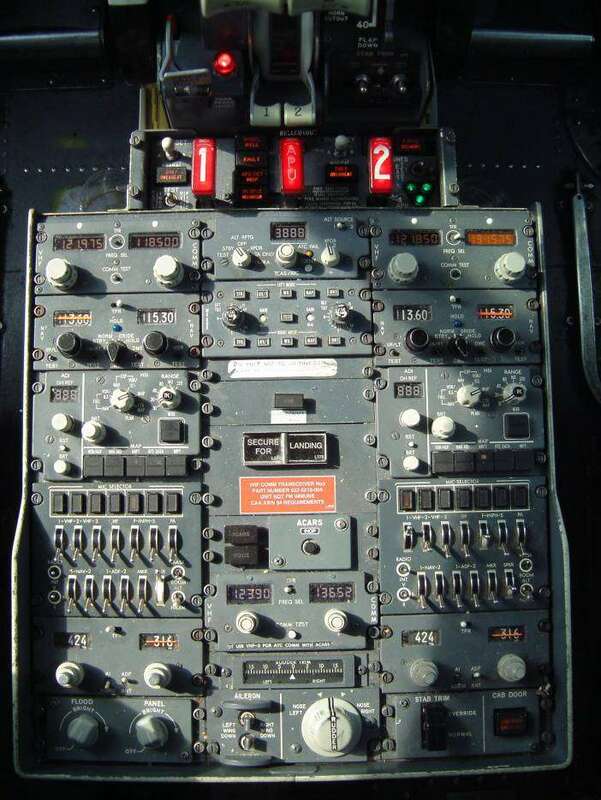 The instrument panel did not change significantly until the -300 and the throttle quadrant is identical except for number of engines and different flap settings (UP, 2, 5, 15, 20, 25, 30, 40). 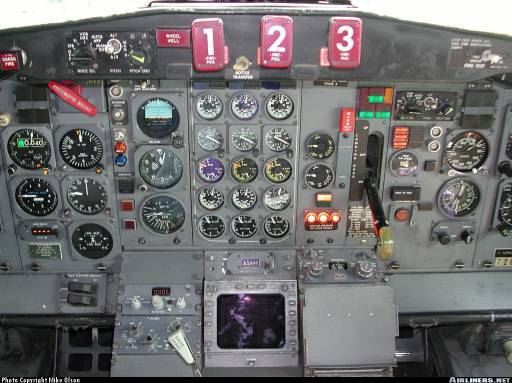 Main differences include: Fire switches on the glareshield panel; three sets of engine instruments and of course, a flight engineers station which is why there are some blanks in the overhead panel. 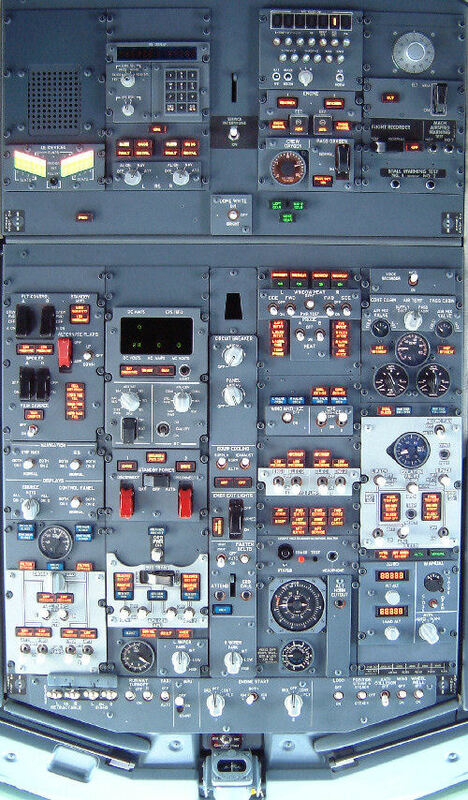 The main feature of the original 737's was their "round dial" AH, HSI & engine instruments. The screen forward of the throttle quadrant is a weather radar. Notice the limited functionality of the MCP and no FMC. The latest of the 737-200Adv's look very similar to the early -300's with a full AFDS MCP, Autothrottle, PDCS, 2 FMC CDU's and a digital colour weather radar in between. 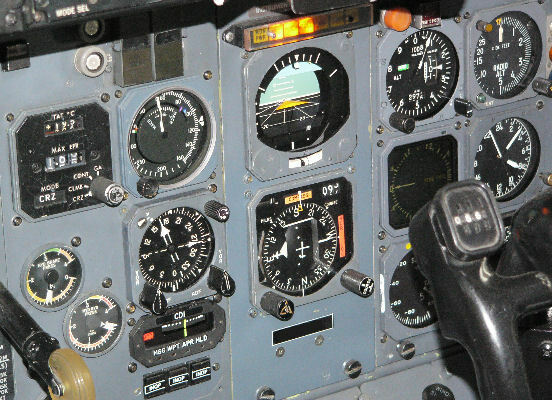 It also has Collins FD-110 flight director and five-inch ADI & HSI; Dual electric Mach/airspeed, altimeter and VSI with dual digital ADC's; Dual RDMI which combines the RMI and DMI; Digital TAT; Pushbutton audio selector panels; VHF comm and VHF nav panels with preselect controls. Just about the only certain way to tell that this is a 200 and not a 300 is the EPR gauge (JT8D's only). 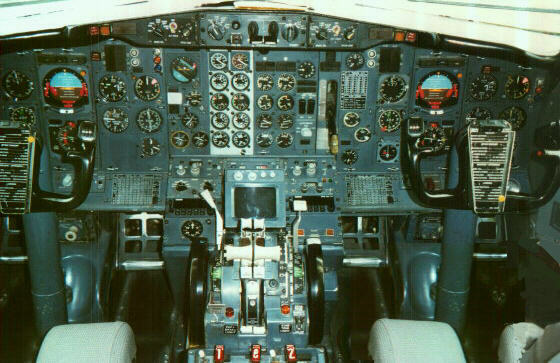 Some early -300's were non-EFIS, had the narrow centre electronics console and round dial engine instruments. The most obvious difference of the classics to the originals is that each pilot now has an EADI which displays the artificial horizon, speed tape, LLZ, G/S, Rad alt and MCP annunciations. The EHSI, can display either navaid or route data superimposed with beacons, airfields, FMC route (shown on the LH display), wx radar & TCAS data. The two FMC CDU's are forward of the throttle quadrant. The centre electronics console is one radio box wider than the originals to accommodate the extra avionics. The original width can be seen by the fire panel. This particular -300 dates from 1990 so it has the digital EIS display rather than the "round dial" engine instruments. It also has a flap load relief light and had an auxiliary fuel tank which is now removed as can be seen by the blanking plate over the missing fourth fuel gauge and the extra pair of fuel pumps on the overhead panel. Other post 9/11 modifications include a locking flight deck door (aft elec panel) and cctv camera displays of the cabin (between the CDU's). The large white knob in the middle of the electrics panel is a countdown timer. In the NG, the larger PFD/ND (formerly known as EFIS/MAP) are now side by side to fit into the space available, controls for these are located either side of the MCP. The EIS & fuel gauges are both on the central CDS with a sixth screen below that, between the CDU's. The flat panel displays have the advantage over CRT's of being lighter, more reliable and consume less power, although they are more expensive to produce. The overhead panel remains largely unchanged since the -100, apart from a digital AC & DC metering panel & DCPCS. 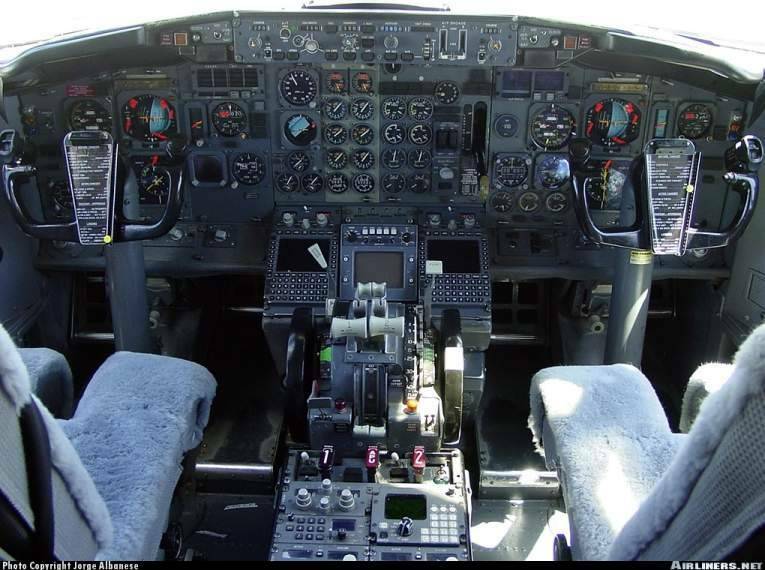 To be easy for current 737 pilots to operate. 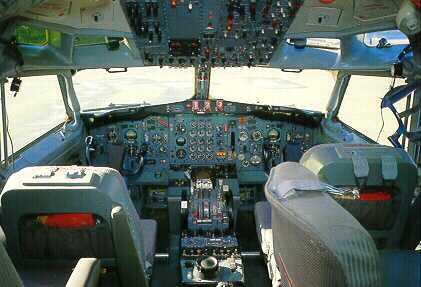 To anticipate future requirements eg transitioning to 777 style flightdecks. To accommodate emerging navigation and communication technologies.